We have always fitted bedrooms, infact we have a part of our showroom dedicated to fitted bedrooms. 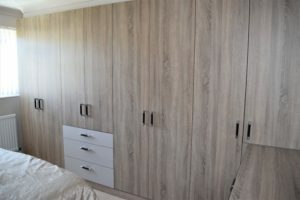 In line with our kitchen offering, our bedrooms are bespoke designs where anything is possible, with options for all sorts of internal features to help you store and organise your belongings. There are a wide range of colours, styles and finishes to choose from. Here’s an example of a fitted bedroom in oak and gloss stone we have recently installed in Hedge End.